BMW is launching a new high-performance, 3.0-liter inline six for its M cars. No surprise yet. It also has three turbochargers, produces 381 hp and 546 lb-ft of torque, and only revs to 5,400 rpm. Ruh Roh. Yes, it's a diesel. BMW announced the new, aluminum-crankcase engine on the eve of the introduction of several new, diesel M models: the M550d xDrive sedan, M550d xDrive touring, BMW X5 M50d and BMW X6 M50d. The idea of an oil-burning M car may send M purists to the barricades, but it makes perfect sense in a world increasingly obsessed with fuel efficiency. BMW says its EfficientDynamics technology, which in addition to having "Efficiency" in the name, also includes automatic start-stop and ECO PRO mode, will accompany the new engine. Those three turbos will be strung together via the company's existing TwinPower system, with a plus-one added in some manner. In the new models, the engine will be paired with BMW's eight-speed sports automatic transmission and an M-tuned xDrive all-wheel drive system. 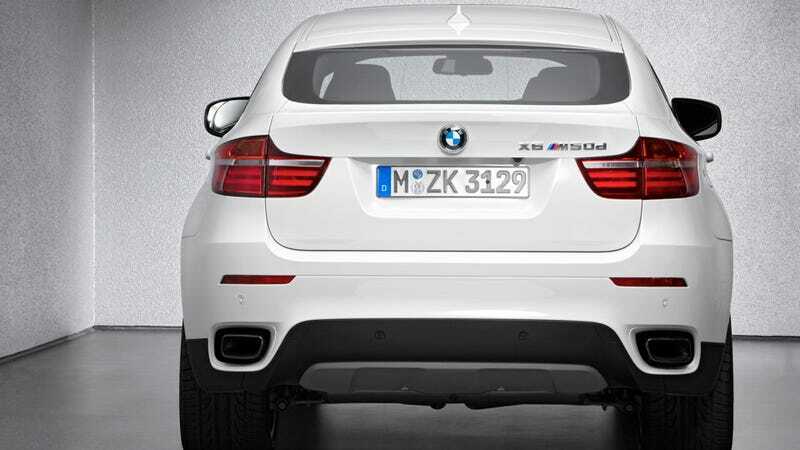 4.9 seconds; BMW X5 M50d: 5.4 seconds; BMW X6 M50d: 5.3 seconds. No mention of U.S. launch of the new models.